Mobile dog grooming is becoming increasingly popular but it does usually cost a little more than paying for professional grooming in a parlour. Such costs are seldom a cost factored into the decision to own a dog. It’s easy to understand how this happens. Dogs make such wonderful pets, and the desire to own one can be so strong that the potential owner’s power to hold themselves to financial logic, can often become compromised. For this reason, many very first time dog owners choose to manage dogs over other possible pets. People who carry out the responsibility of getting a dog as a pet should realize that it is a significant responsibility, and many breeds that appeal especially strongly to first time dog owners need a lot of grooming. All first time puppy owners should especially pay attention to this. 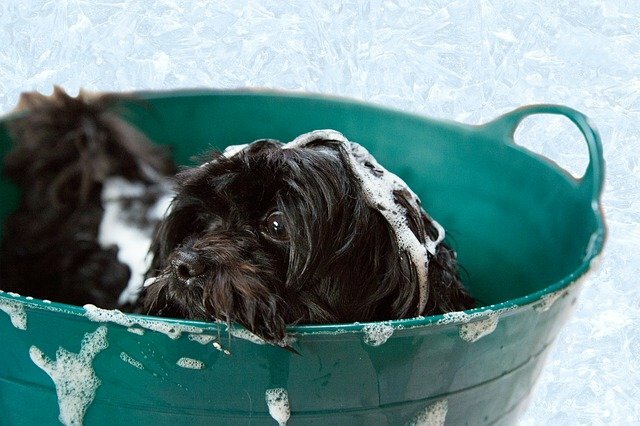 Good, regular, dog grooming will be essential to the health of some breeds, such as some Poodles, Chihuahuas etc., and other long haired breeds. It is of course, immediately obvious to most people that a dog’s coat will need to be brushed, and for many breeds also stripped regularly to avoid matting and health issues to the dog’s skin, that can follow. However, for many breeds grooming and trimming is also necessary to cut back hair over the dogs’ eyes (to prevent loss of vision), and mouth (to avoid the build-up of food in an excessively long beard), and even to cut back the growth of excessive fur around their paws. This can be necessary to avoid impacted mud and grit becoming caught between the dog’s paw pads, leading to the development of foot sores. For the busy owner, they need to account for dog grooming, and there are good reasons for using a mobile service rather than taking a dog to a grooming parlour. That is due to the fact that, for many dogs mobile grooming is preferred, because it is a much lower stress activity, when they are not removed from familiar surroundings, and their owner, for the stressful grooming sessions. One of the more important things to comprehend when determining the successful results of your dog grooming session is how your pet is behaving whenever you pick them up coming from a groomer. Specialized and professional groomers learn how to handle stressed and nervous unruly animals which may lurch, leap and jerk during grooming sessions. Some will even lay flat in the grooming table like unresponsive sloths! The mark of a good groomer will be their ability to overcome such canine un-cooperativeness and provide a successful session. This must be done, even in cases when your pet is difficult to handle. By using a mobile “groom in your home” service the owner can be sure to be present and gauge the skill of the groomer to handle the animal with sympathy, even in the face of unruly behaviours by the dog. I addition, many people who own dogs enjoy to make their dogs appearance and feel pretty. You can blame people like Madonna or movies like Legally Blonde, for that if you wish. However, small dogs have continually increased in popularity. in fact, they are close to being a girl’s favourite accessory. These dogs must be kept looking in tip top form, for their owners, to satisfy their owner’s love for stylish living. So, what could be better for the owner than to be present to oversee the grooming work, when the visiting mobile dog groomer arrives. Dog grooming is an additional challenging activity for many breeds which that puppy owners should consider when selecting their breed. Once bought the need for grooming won’t be optional to maintain. It takes constant attention as well as a regular schedule, just like how humans groom themselves regularly. Most people simply do not have the time to be running their dog to and from the dog grooming parlour, and that’s where engaging a mobile dog grooming service is an obvious solution. Nevertheless, closer inspection to your dog’s behaviour may help owners and groomers alike to get your dog’s coat looking the best it can. Some groomers will allow prospective customers to look at the way that they handle other doggy customers before they bring in their pets, and this is especially easy to witness if done in your own home by a mobile dog grooming service. Look at it this way… The groomer is probably not as professional as most owners would expect, if the groomer is angered responding to unruly or snappy behaviour from a dog. While all dogs can snap or gently bite to discourage grooming, master groomers will be skilled in how to discourage and stop this behaviour during a dog grooming session. Therefore, what could be a better plan for grooming your dog, than you engaging a mobile dog grooming service. Same with humans, dogs must be groomed to stop infestation of fleas or any other parasites that may harm your dog’s health. Dog grooming is just not for show dogs only. No matter what breed, they must be groomed, but some will need to see their mobile dog groomer more often than others. It may be little difficult to take the dog to a grooming parlour for a busy owner. So for them mobile dog grooming service is preferable. I recently got a dog so thanks for sharing this. I like your point about how mobile dog groomers can help free up your time. I might consider looking into this more since I’m always too busy to go to a groomer.